AB Evaluation's Blog offers current information and tips on Special Education, School Psychology, educational evaluations, IDEA updates, and related topics. I wanted to share with you this amazing opportunity for all of us Houstonians: a Pivotal Response Treatment (PRT) training is been hosted in our city! The PRT is a research-based approach, derived from applied behavioral analysis (ABA), which is play-based and child initiated. Its goals include the development of communication, language and positive social behaviors and relief from disruptive self-stimulatory behaviors. Rather than target individual behaviors, the trainer targets “pivotal” areas of a child's development. These include motivation, response to multiple cues, self-management and the initiation of social interactions. The philosophy is that, by targeting these critical areas, PRT will produce broad improvements across other areas of sociability, communication, behavior and academic skill building. The training is a collaboration between Region 4 as well as Drs. Robert and Lynn Koegel, national presenters. Can you believe is May 13th! Last Friday, storm and all, the Bilingual Assessment Leadership Group (BALG), had our last meeting of the year. Everyone wanted to talk about the Cross-Battery Assessment, Third Edition and how this impacts bilingual assessments. It seemed to me that there is still plenty of questions to be answered in regards what best practices are when using this new tool. We were all eager for answers! It was great to share our ideas and opinions. As a group we really thrived to better our practices without compromising what we know it is essential when evaluating bilingual students. Bilingual Special Education EvaluationSummer Institute: Summer Assessment Institute for EducationalDiagnosticians& Licensed Specialist in School Psychology. and infinite experience in servicing bilingual student with special needs. You are the best! A good friend of mine share with me this article published by the online news paper MailOnline. The article is about a wonderful young man diagnosed with Autism. 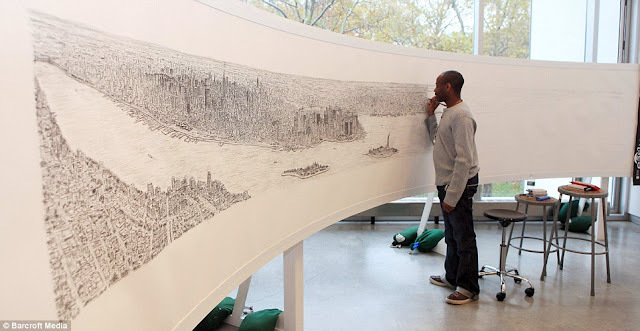 His name is Stephen Wiltshire; he is beyond gifted. I see him as an inspiration to us special services providers. This shows us that early identification, understanding, research and knowledge, as well support services to children with disabilities, opens a horizon of possibilities for them. I was so excited to learn about Stephen, especially, since I just shared with a parent the evaluation results of a student that met federal and state guidelines as a student with Autism. I immediately wanted to know more about Wiltshire and everything he has accomplished. Wiltshire has travel the world and his work has been exhibited and sold in numerous countries including the UK (home town) and Bermuda where the sale of his drawing of Hamilton broke auction records. "Autistic artist Stephen Wiltshire draws spellbinding 18ft picture of NewYork from memory... after a 20-minute helicopter ride over city"
Cross-Battery Assessment, Third Edition (XBA 3) is Finally Here! After weeks and weeks of postponing the date because the book wasn't ready yet; last Thursday April 4th Region 4 conducted their first training on the Cross-Battery Assessment Update. We finally started to get the XBA model and now best practices are updated once again! So what’s new? a. The CHC Model of Cognitive Abilities that guided Intelligence Test Construction from 2000-2011 included 10 different abilities: Gf, Gq, Gc,Grw, Gsm, Gv, Ga, Glr, Gs, and Gt. b. Current expanded CHC Model of Cognitive Abilities (adapted from McGrew 2005 and Schenider &McGrew, 2012) includes 16 different abilities: Gf, Gc, Gkn, Gq, Grw, Gsm, Gsm, Glr, Gv, Ga, Go, Gh, Gp, Gk, Gs, Gt, and Gps. The user inter-phase is awesome! It’s actually exciting to enter scores in it. I know what I am going to be doing this summer: getting as much practice as I can with this update. I don’t believe school districts are going to jump to this transition ASAP, just because the extensive training that it’ll require. Have you heard anything from your District? Let me know what’s going on your end. In my experience with school districts it continues to amaze me the fact that in every school I visit, I find myself constantly assisting teachers and administrators in understanding some basic RTI concepts. Some schools struggle with the limited resources they have to identify and support students before they fail. Other schools have trouble implementing a unique RTI vision. While some others, spend plenty of time manually manipulating student data. In many opportunities, by the time they find out the student's needs or the impact of the interventions, valuable time has passed. Implementing an RTI process requires an understanding of many aspects as the district culture, the students and faculty demographics, social economic aspects, and so forth. With so many approaches, it is really difficult to have a common vision of how should and RTI process should look like. When it comes to educational issues, there is not a silver bullet; however, I wanted to take some time to put together in a video my view of how to implement an RTI process to support these schools. In this video I explain what an RTI process is (and what is not), the main challenges school districts have, and comprehensive solution to some of the problems I frequently find in the field. It is sad to see our students failing when we have plenty of tools to help them, but such a short time to implement those tools. At the end of the day, is necessary to create that synergy from all participants (faculty and administrators) to get in the same page and work for a common vision to help our students reach their academic potential. How is your school or district RTI implementation compared to this framework? For the last 2 months I'd been anxiously waiting to attend Dr. Ortiz's training “Evidence Based Instruction and Evaluation of Diverse Learners Using Culture-Language Interpretive Matrix” in Katy ISD. The launch of C-LIM and the recommended “Best Practices Approach for Evaluating ELLs” is really changing the way we have been doing bilingual assessment here in Texas. I had so many questions and concerns. Honestly, I must say that Dr. Ortiz answered most of them. He provided a comprehensive analysis of the issues that the current bilingual assessments procedures, as well as the recommended Best Practice Approach. Administer all tests in standardized manner in English only, no modifications. This was such a shock for me and the audience in general. We no longer determine language proficiency first? We no longer test in the native language? No, is the answer to both questions. As dramatic as this may sound, research supports this procedure even if the student is currently enrolled in a bilingual program, and has very, very limited English language proficiency. It is definitely nerve racking to think about sitting at an ARD meeting and try to convey this information (tons of research and technical wording) to the members of the committee that just want an explanation of why the student is not learning. This new approach also means that will be recommending changes as far as instructional programming for ELL’s students within the general education setting. Region 4 will be announcing the upcoming Cross Battery update training date -schedule for April 2013, and possible future visits from Dr. Ortiz. Dr. Ortiz has studied and published on topics that include assessment of culturally and linguistically diverse individuals, application of modern intelligence theory in testing through CHC Cross-Battery assessment methods, differentiating cultural and linguistic differences from disorders, and development of the CHC Culture-Language Matrix as a method for determining the primary influence of culture and language on test performance. 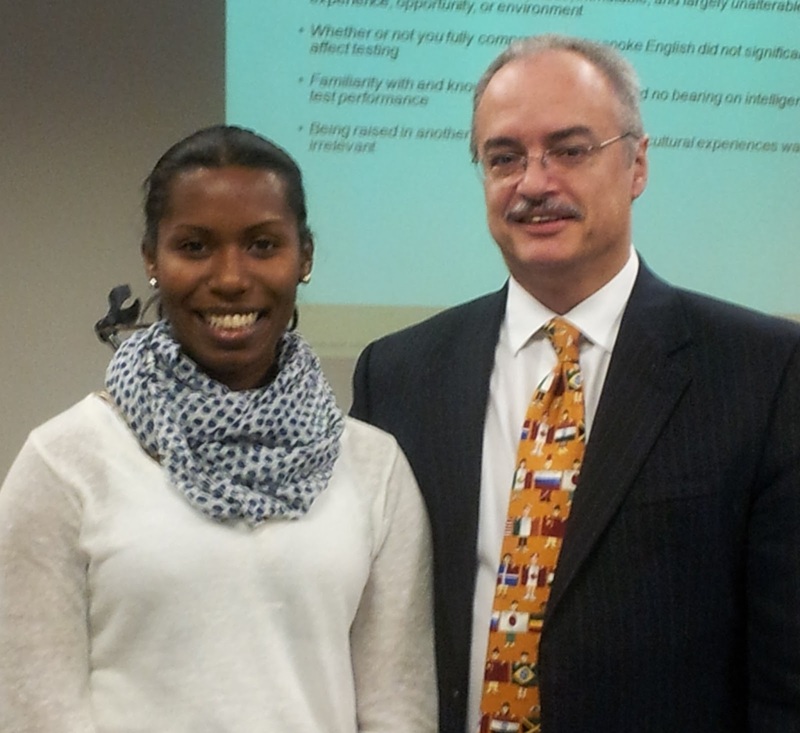 He recently authored three chapters in NASP's Best Practices IV on nondiscriminatory assessment, contemporary intellectual assessment, and working with culturally and linguistically diverse children and families. All rights reserved - © 2013 AB-Evaluations.com. Powered by Blogger.